Burdock Blood Bitter is the cure for you, or at least that's what this c.1880's Victorian Trade Card claims. Featured here is the newest addition to my growing collection of late-19th Century Baseball-themed trade cards. 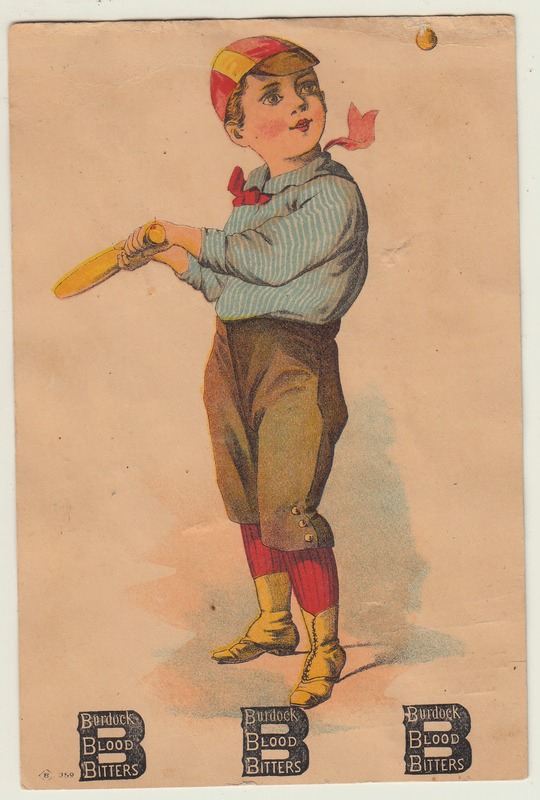 It features an advertising card of a well dressed boy in a striped jersey top and bloomer-style pants. Best of all, he's eyeing a high flying eephus-style pitch. No doubt, he is aiming to whack the cover off the ball. Although, he does look a bit too relaxed in his stance. I'd like to see him open up a bit. Furthermore, he holds the bat like a Rod Carew, which worked for him, but is likely to result in a weakly hit grounder for this lad. The card measures approximately 4 3/16" X 6 1/2" and has a printers mark on the bottom left; "B 359". It has been previously cataloged in the Keetz Guide of Baseball Advertising Trade Cards as card #210 of single issued cards. Typically, these trade cards were sold by printers to various businesses for use as an advertising medium. 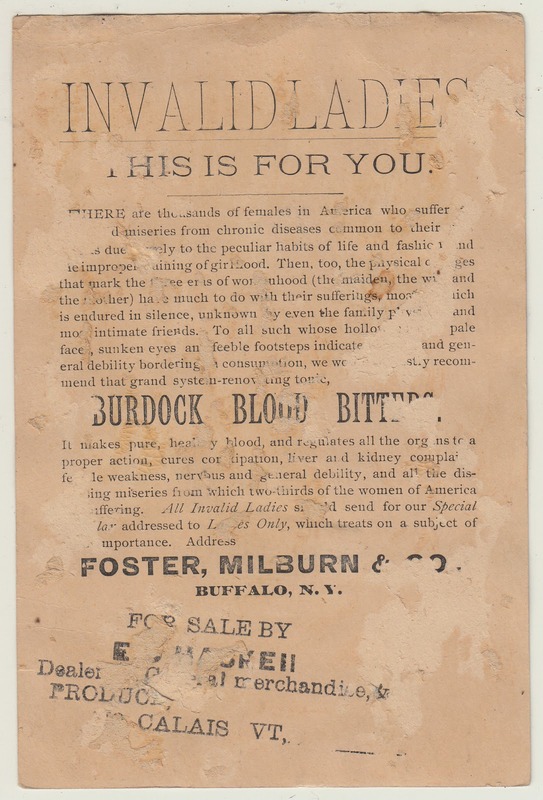 In this case, Burdock Blood Bitters, a cure-all for stomach ailments and cramps, had the printer place their sales pitch on the reverse, and allowed a retailer in Calais, Vermont to distribute it to their customers.